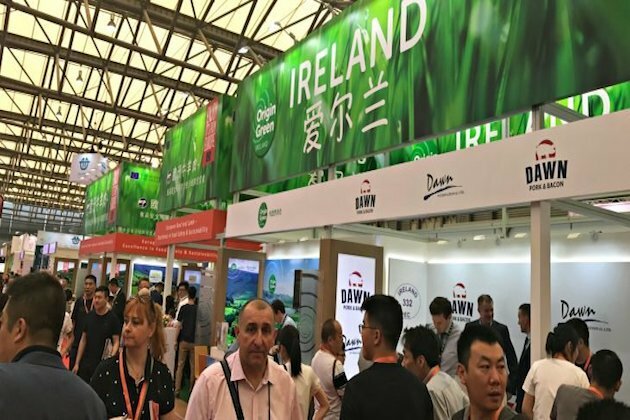 SHANGHAI, China Ireland is being well represented at the CIIE (Chinese Import and Export Expo) being staged this week in Shanghai. Irelands Minister for Business, Enterprise and Innovation Heather Humphreys and the Minister of State at the Department of Agriculture, Food and the Marine Andrew Doyle are leading a delegation which includes Bord Bia and almost a dozen Irish meat and dairy companies. The world-acclaimed expo, which is being opened by President Xi Jinping, is intended to serve as a showcase for Chinas commitment to international trade. I am pleased that CIIE will feature a significant presence from Bord Bia and a total of 11 Irish meat and dairy companies. This will provide aunique opportunity to communicate directly withkey Chinese trade buyers, media and influencers about the quality, safety and sustainability of Irish food and drinks, Mr Doyle said Tuesday. China is our third most important export market, with total agri-food exports of almost 1 billion last year. It is our second biggest market for both dairy and pigmeat, and a significant market for seafood exports. I hope that, now that the market has opened, Irish beef will also be successful in this hugely valuable market. Tara McCarthy, CEO of Bord Bia, said: CIIE provides a unique platform to meet both political and commercial stakeholders of significance in the Chinese market. Working in partnership with the Department, Bord Bia will leverage this opportunity to further build our industrys reputation in the market. Later in the week, Minister Doyle will move to Qingdao to lead Irish participation in the Seafood Expo, one of the largest seafood fairs in the world. Irish seafood exports to China have grown rapidly to over 28 million last year, and there is potential for further growth. Up to 12 Irish seafood companies will be represented on the Origin Green Ireland stand. This trade visit follows technical meetings to discuss meat market access held by DAFM officials in Beijing on Friday; and the Trade Mission to Indonesia and Malaysia led by Michael Creed, Minister for Agriculture, Food and the Marine.